Lulupu - The Craft Lounge: A movie inspired card and a Tutorial! A movie inspired card and a Tutorial! I was inspired by the story of this movie where the lead heroine having lost the love of her life,comes to realize the extent of her husband's love for her when she discovers all those surprise gifts and messages that he has left behind for her.It's a very touching story and is sure to bring tears to anyone's eyes. Hence, I have used the sentiment, 'You fill my thoughts' and the whole scene created with the two birds depicting the loneliness and how much the wife misses the husband the good times she had shared with him. For the embossing twist of the challenge, I have done the embossing on the tree trunk using the Sizzix Woodgrain Embossing Folder and then inking my embossed panel using Tim Holtz Vintage Photo Distress Ink and the background criss-cross grid is also embossed and I have done this embossing using the Martha Stewart Scoreboard. After having scored it, I have inked it using three different Distress inks- Tumbled Glass for the sky, Antique Linen in the middle and Shabby Shutters for the grass and greenery. Take a piece of 4.5 inch X 6 inch card panel and place it along the triangle envelope maker that comes with the Martha Stewart Scoreboard and score your panel every 1/4 inch which is indicated by the black lines of the score board as shown in the picture above. Create the score lines diagonally. Then, flip over your panel and score in the same manner as before. You will end up having his criss-cross grid. Then, you can ink this panel using any colour inks of your choice. I have used Tumbled Glass, Antique Linen and Shabby Shutters Distress inks. 3. Distress inks of your choice. 4. Ranger Ink Blending tool and Ink Blending Foam. I also wanted to show you a fun way to create a brick background tutorial using the scoreboard. For this, you will need a cardstock, you can choose any colour you want, I preferred doing it on a light brown one. The cardstock should measure approximately 4.5 X 5.5 inches.Now, place the short end of the cardstock against the scoreboard and score at every 1/2 an inch to create parallel lines as shown below. Once, you have scored it on the short end, turn your cardstock around and start scoring the long end that is the 5.5 inch side of your cardstock. Create the scores at every 1 inch interval on the first line and the below you score at 1/2, 1 1/2, 2 1/2 inch etc, till you reach the end of your panel. Once the brick pattern is created, place your cardstock on a Craft Sheet and ink it using any brown ink of your choice to bring out the effect of the score lines prominently. You can use other colours besides brown to bring out the brick effect like Greys, lighter shades of black and yellow's even or you can even mist your panel to give it a more realistic look. You can further enhance the look a brick wall by cutting out small pieces from the middle, sides, or below part of the panel as shown in the picture. This will give a more realistic look to your embossed background. Now, you can use this embossed part to create a card or even as a part of your layout. Hope you like my card and tutorial. Please do let me know your comments/suggestions regarding them. I would love to hear from you. Beautiful card Husssena!!! tfs tutorial!! Beautiful card Hussena and thanks for tute on bricks! WOw ! Wonderful tutorial ! Stunning !! I love this card! Super gorgeous card and lovely interpretation of the movie. 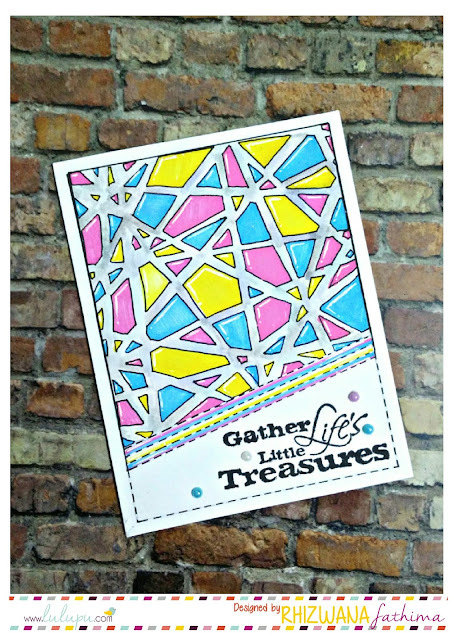 Love the pretty scene you have created and the way in which you've incorporated the embossing twist is just fab!! I m going to try the brick tutorial soon...thanks for sharing. Wow! Lovely card Hussena! Such a gorgeous card! I loved the movie and I love the way you took the essence and poured it into your beautiful card! Sooo cute! Another awsm creation...:) Cuteness many folds!! A v pretty card. And d cutest lil flowers. Lulupu Challenge #31, Movie Inspiration.. Pastel Feminine card with colouring! A Card with Punch flower tutorial and Some News ! Lulupu Challenge # 30- Feminine Cards!